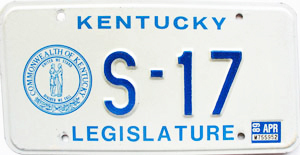 A 1989 Kentucky State Senate license plate # S-17, in good condition as pictured. This license plate was issued to District 17 Democrat State Senator Charlie Berger, who served Bell, Letcher, Perry and Harlan County areas from 1980 to 1996. Senator Berger passed away in 2016.